Save or Shred? Follow These Recordkeeping Guidelines. | TMA Small Business Accounting, P.C., P.C.TMA Small Business Accounting, P.C. Save or Shred? Follow These Recordkeeping Guidelines. Which records can you purge today? In 2018, you can generally throw out records for the 2014 tax year, for which you filed a return in 2015. You’re not necessarily safe from an IRS audit after three years, however. There are some exceptions to the three-year rule. If the IRS has reason to believe your income was understated by 25% or more, the statute of limitations for an audit increases to six years. If there’s suspicion of fraud or you don’t file a tax return at all, there is no time limit for the IRS to launch an inquiry. 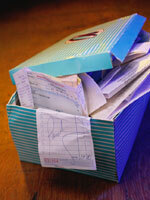 For most people, old bills and receipts make up the bulk of what’s in their files. 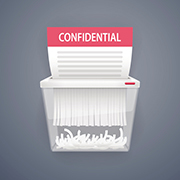 In general, it’s OK to shred most bills — like the phone bill or credit card statement — when your payment clears your bank account or at year end. Keep these for as long as you own the property, plus three years after you dispose of it and report the transaction on your tax return. Throughout ownership, keep records of the purchase, as well as receipts for home improvements, relevant insurance claims and documents relating to refinancing. These help prove your adjusted basis in the home, which is needed to figure any taxable gain at the time of sale, or to support calculations for rental property or home office deductions. To accurately report taxable events involving stocks and bonds, you must maintain detailed records of purchases and sales. These records should include dates, quantities, prices, dividend reinvestment and investment expenses, such as broker fees. Keep these records for as long as you own the investments, plus the statute of limitations on the relevant tax returns. The IRS requires you to keep copies of Forms 8606, 5498 and 1099-R until all the money is withdrawn from your IRAs. With the introduction of Roth IRAs, it’s more important than ever to hold onto all IRA records pertaining to contributions and withdrawals in case you’re ever questioned. Keep these for four years from the date the tax was due or the date it was paid, whichever is longer. State regulations vary. For example, New York generally requires sales tax records to be retained for three years, while California requires four years, and Arkansas, six. Check with your tax advisor. Brought to you by: TMA Small Business Accounting, P.C., P.C.